Wolfgang Amadeus Mozart’s birthday, which is January 27, should be a nation-wide holiday, such was his contribution to western music. When I was a piano student, I found the simplicity of his lines were deceptively difficult; unless they were played *perfectly*, his sonatas sounded like a massive flop. I always longed to sink my fingers into some meaty Beethoven piano works while I was learning Mozart. Then, when immersed in the depths of Beethoven, I longed for the sunnier climes of Mozart. I took a poll of our in-house music experts, the hosts of all our programs on The New Classical FM. I wanted to know 1) their opinion why Mozart was one of, if not, THE greatest composer of the classical genre; and 2) what their favourite Mozart piece is. It was a fun read with some surprising answers! Well, off the top of my head – and this is my usual “quip” answer – is that he is happy, bouncy and somewhere around the key of C. But it’s true in some sense. There is a joy that permeates his music – even in minor keys and sombre works. For me, the joy that one gets from playing an instrument, discovering something new or learning how to play something just radiates from his music. He is – for lack of a better phrase – a musician of the people. He creates music for the creative. Combine this with a staggering output of quality in all genres in such a short period of time is nothing short of astonishing. Favourite pieces? Two of them actually, and both, weirdly enough, from double concertos! I adore the final movement of the Sinfonia Concertante for Violin and Viola in Eb, K.364 and the gorgeous slow movement from the Flute and Harp Concerto in C, K.299. Mozart uses an economy of means to communicate the story. Nothing is wasted. Consequently he creates a specific vocal language. All of the answers are in the music. His music requires a singer to be at the top of their game. You can’t fake singing Mozart. He won’t let you … nor should you ever, for that matter. Mozart sets a wonderful bar to aspire to. It’s tremendously satisfying. Every time I ask a vocal coach how to approach a phrase in a Mozart score I am reminded to listen to what comes before a phrase. Mozart gives it to you. My favourite Mozart piece is Laudate Dominum from his “Solemn Vespers”. I particularly like Mezzo Soprano Elina Garanca singing it. The music sits beautifully in the Mezzo (middle) voice. The long legato lines are stunning, and communicate the meaning of the message i.e., “Praise the Lord”. In my opinion, Mozart is “the top”, number one. Incomparable musicality combined perfectly with joyous playfulness. His portrait should accompany every dictionary definition of “genius”. My fave is the opening movement to his Symphony No. 40 – it lifts you to heavenly heights of beauty and charm. Mozart had the musical equivalent of the Midas touch in that there was no form he did not turn to gold: symphony, opera, chamber music, concerto, masses, you name it, and it’s 24 karat when Mozart’s done with it. We will not see his like again. Must I have a favourite? My idea of paradise would be rehearsing and performing Mozart for all eternity. 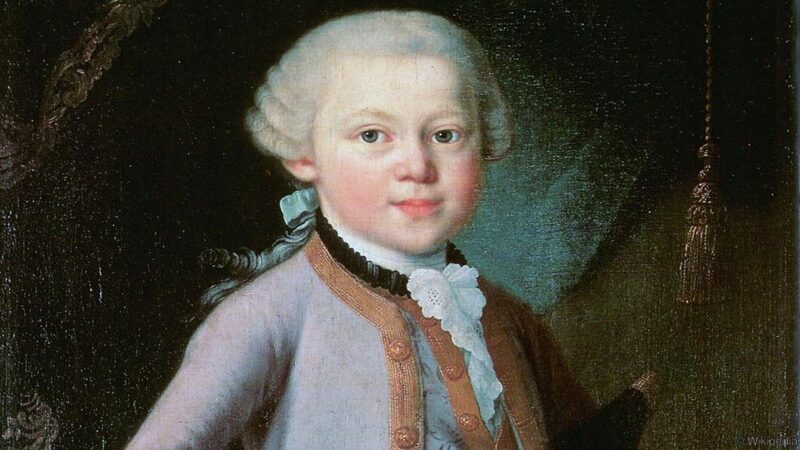 Mozart has, in some ways, the disadvantage of writing in the dead-centre of the Classical Era — a time when the aesthetic of music is very light and very formal. In lesser hands — and to modern ears — it is a style that can come across as simplistic, square and not too fiery in the blood. But within the strict bounds of his era, Mozart does astonishing things. He is like a great painter who can create magic with one single charcoal line. His melodies are unfailingly elegant, his textures transparent but never banal, and within all that formality he manages to touch on every vibrating nuance of human feeling and experience. Favourite Mozart piece?? Quite impossible. But for the purposes of this occasion it’s a toss-up between his final symphony, the “Jupiter”, and the Piano Concerto No. 24 in C minor. As a violist, I’ve played in both many times, and I love the Jupiter for its energy, and the astonishingly clever layers beneath its accessible surface; the C minor Piano Concerto shows a darkness not immediately associated with sunny Mozart but, wow, could he ever go there! PS: Oh man — as I keep thinking — as a viola player, I have to name the String Quintet in G minor – juicy and exquisite! And features TWO violas! Sometimes The Great Spirit sends us a special messenger to prove His/Her existence. “Eine kleine Nachtmusik”. But only because it was probably the first Mozart (Other than “Twinkle, Twinkle, Little Star”) I ever heard. What makes Mozart number one was how prolific he was. Everything he wrote was a gorgeous, substantial work, even things he tossed off quickly. He was one of the first composers to write a large number of piano concertos, a real gift to the genre. He improved the form of everything he wrote, and the diversity of what he composed was vast; he didn’t specialize. Mozart could do anything: operas, symphonies, string quartets, and his Requiem … he was the jack of all trades, and master of all. My favourite works? I’m drawn to his two G minor symphonies, the 25th and 40th. They just resonate with me – I like the dark, brooding, and “angsty” Mozart. Runners-up would be the Symphony No. 41, “Jupiter”, and the “Papageno-Papagena” duet from “The Magic Flute”. It’s playful, fun, pretty: a true opera “hit”. I also can’t leave out the Overture to “The Marriage of Figaro”. I feel the mighty Mozart deserves to be in the top three because of his astoundingly versatile output ranging from keyboards to opera, symphonic works to chamber delicacies, and all created before his tragic death at 35. And his music always contains his own unique touch of humour woven into his creations. Certainly one of the greats. I have a number of favourites but I give my heart to the Adagio from the Clarinet Concerto…for its magical ability to re-order time and float me away to a special place each time I experience it. Mozart really has something for everyone, for every mood and every age and every occasion. Pretty much all his music ranges from great to wonderful to sublime. Re: my favourite piece … that keeps changing depending on the mood and the situation and what kind of music you need to interact with at any particular moment. Two bits I often turn to are the slow movements from the Clarinet Quintet and Ruhe Sanft from Mozart’s unfinished opera, “Zaide”. Two living legends of opera, Bryn Terfel and Cecilia Bartoli sing the “Papageno-Papagena” duet from “The Magic Flute”. There isn’t video, but Bryn and Cecilia are so good, all you need to do is listen.